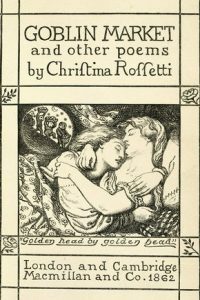 The sister of the renowned pre-raphaelite painter Dante Gabriel Rossetti, Christina Georgina (1830-1894) was a feminist poet involved in the pre-romantic English literary movement. 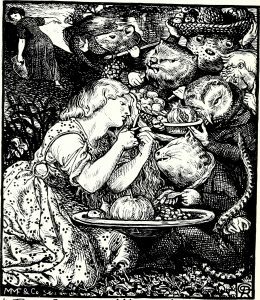 In her most famous poem, “Goblin Market,” she describes a band of goblins characterized by beastly features. 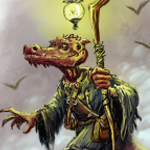 5E stats are provided for those unusual monsters, aimed at GMs who want to give a fresh spin to a too-much-classic critter. 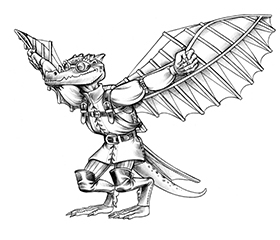 Including Rossetti goblins in fifth edition adventures is easy. It is sufficient to apply the following traits to the standard goblin stats found in the core rules. Pounce: If the feline goblin moves at least 20 feet straight toward a creature and then hits with a melee attack on the same turn, that target must succeed on a DC 11 Strength saving throw or be knocked prone. Tail: Melee Weapon Attack: +2 to hit, reach 10 ft., one Large or smaller creature. Hit: 2 (1d4) bludgeoning damage and the target is grappled (escape DC 11). Until the grapple ends, the target is restrained and has disadvantage on Strength checks and Strength saving throws, and the goblin can’t use the tail on another target. Rat goblin. Covered in dark gray oily fur and with large teeth, this monster has a speed of 60 ft.
Snail goblin. The lower part of this goblin’s body resembles that of a snail, and on the back a strong carapace can be found. Its speed is only 15 ft., but its AC is 16 and has 13 (3d8) hit points. Its Challenge Rating is ½.
Ferocious: At the start of its turn, the goblin can gain advantage on all melee weapon attack rolls it makes during that turn, but attack rolls against it have advantage until the start of its next turn. I love these variants! Maybe there should be an official Midgard set of monsters that utilizes these types of goblins. It’s inspired me to write a whole new adventure. Thank you! These sound like great options for Tome of Beasts 2!